You don’t have to spend a lot of time with your seasonal decorations. 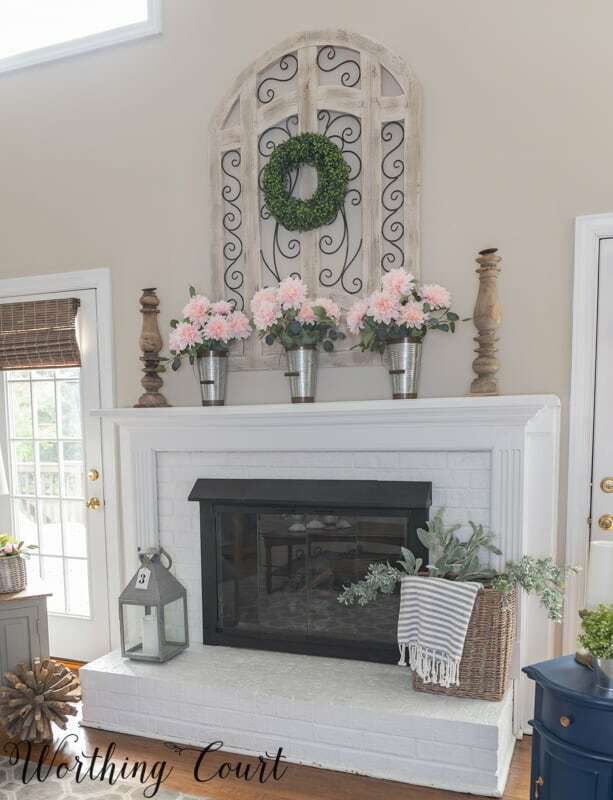 These easy ideas will show you how you can decorate your mantel for spring in 10 minutes. 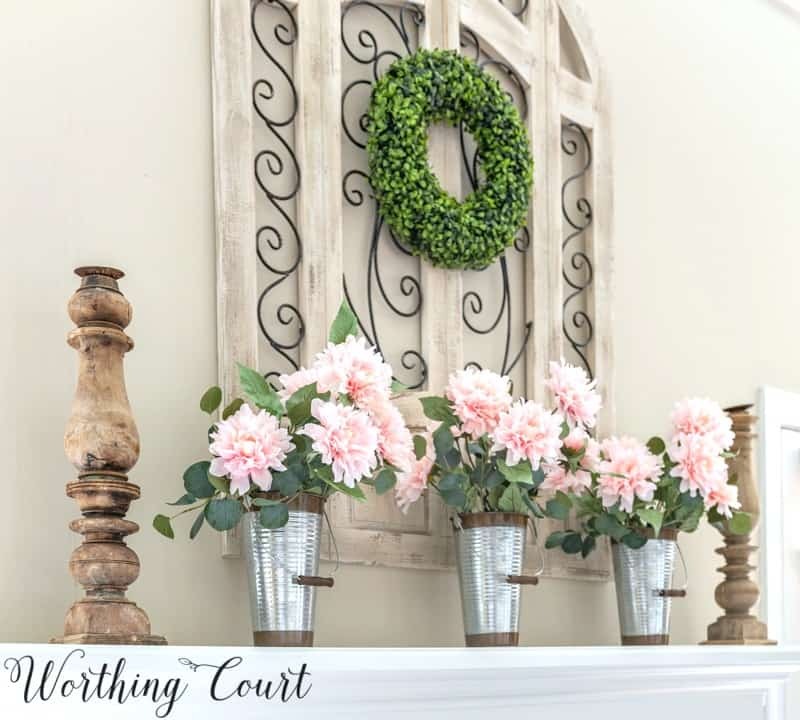 The inspiration for my spring mantel this year came from these gorgeous pink floral bushes. I just love the deep shade of pink in the center that fades to a lighter shade on the outer edges. 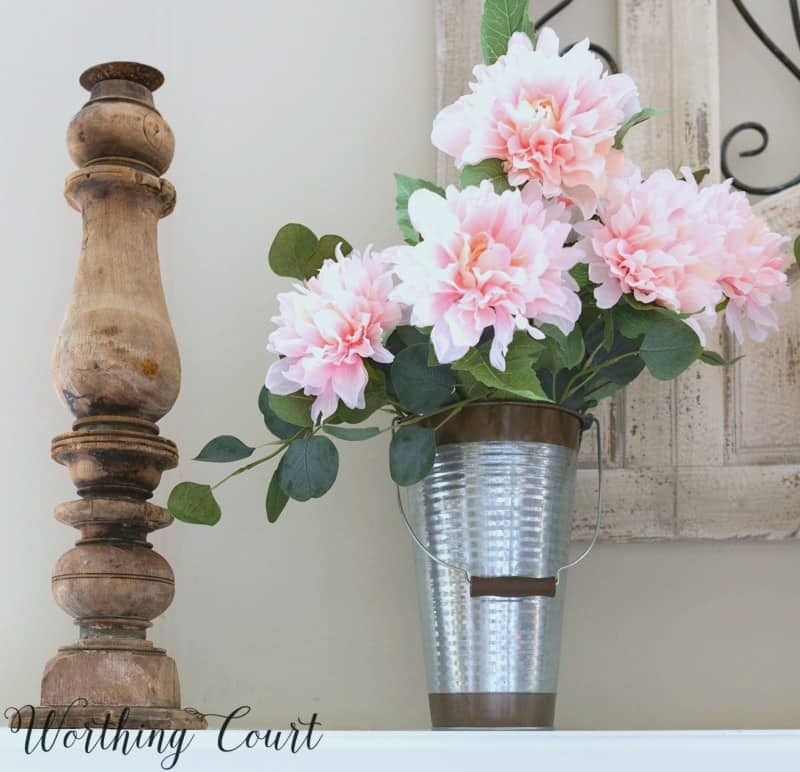 Using floral bushes instead of individual stems makes it super fast and easy to arrange in a container. I added three stems of eucalyptus (that I cut from a faux eucalyptus bush) to each container for added interest. Lining several galvanized buckets up in a row creates more of an impact and flanking the containers on each side with candlesticks helps to give definition to the display. Can we just stop for a minute and stare at these yummy candlesticks?!? I picked them up on my recent trip to Magnolia Market. I didn’t place candles on them since the tops are a bit wonky, but I think that the wonkiness just adds to their charm. Remember my post about K-I-S-S decorating? That philosophy of mine definitely comes into play anytime that I decorate my fireplace, no matter the season or holiday. I keep this large wood and metal piece above my fireplace year-round. It provides me with a great backdrop and provides instant layering and texture. 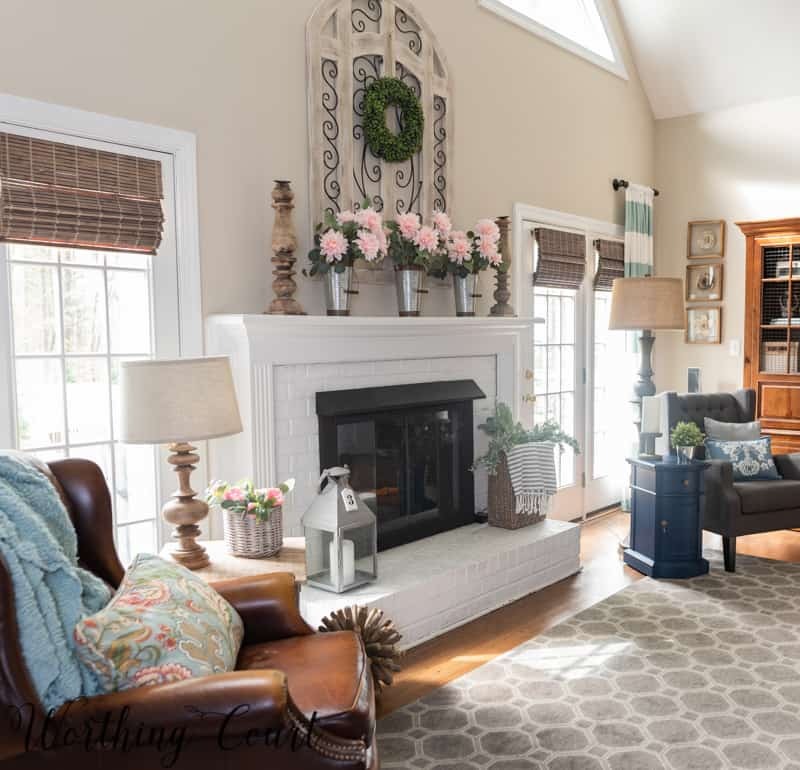 Add a basket filled with a pretty throw and faux greenery on one side of the hearth and a large lantern holding a simple white candle to the other side and you’re done! See – easy peasy and done in 10 minutes! What’s your favorite fast and easy decorating trick? Beautiful but simple! Love it! Thanks for the pretty inspiration! I love the simplicity of everything as well. Also thanks for posting your resources. I really enjoy knowing where I might purchase them as well. You have a very sweet heart. Enjoyed seeing your daughters wedding pics…….such a wonderful gathering of simple but very pretty and welcoming. 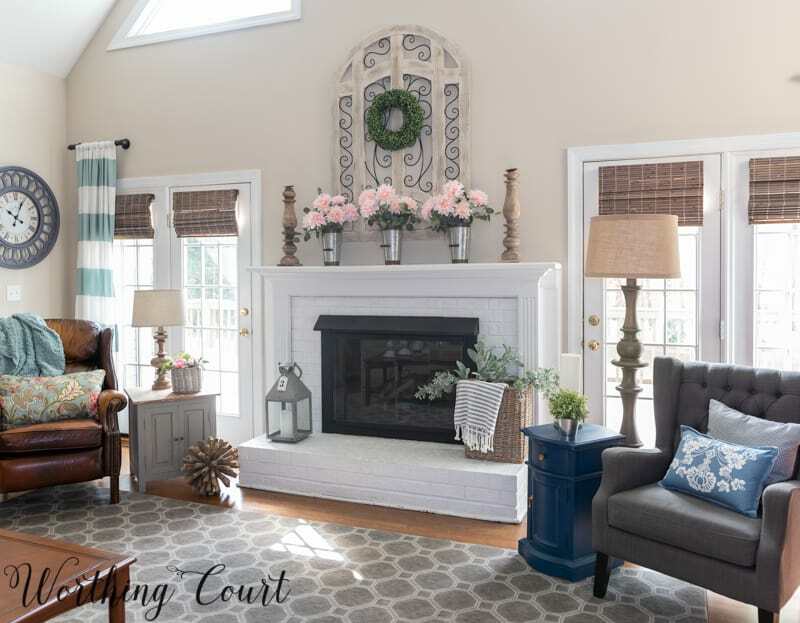 You’ve created a beautiful spring mantel. It’s simple, but striking. Great job! I think I picked up that same peony bush! I bought several to cut apart to update my peony front door wreath, but they were so pretty, I saved one and added it to an antique silver ice bucket and — voila — a centerpiece is born! Like your large wooden piece, I use a few blue and white porcelain urns and ginger jars as my year round background (they do come down for Christmas to make way for my reindeer and tree collection). 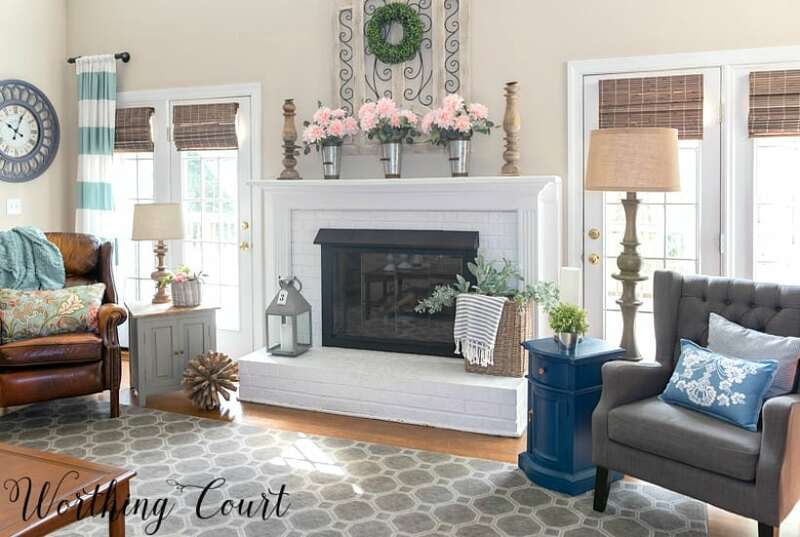 I agree that having one piece, or collection of pieces, that are your baseline allows you to add just a few seasonal pieces for a 10 minute makeover. And those wonky candlesticks are to die for! 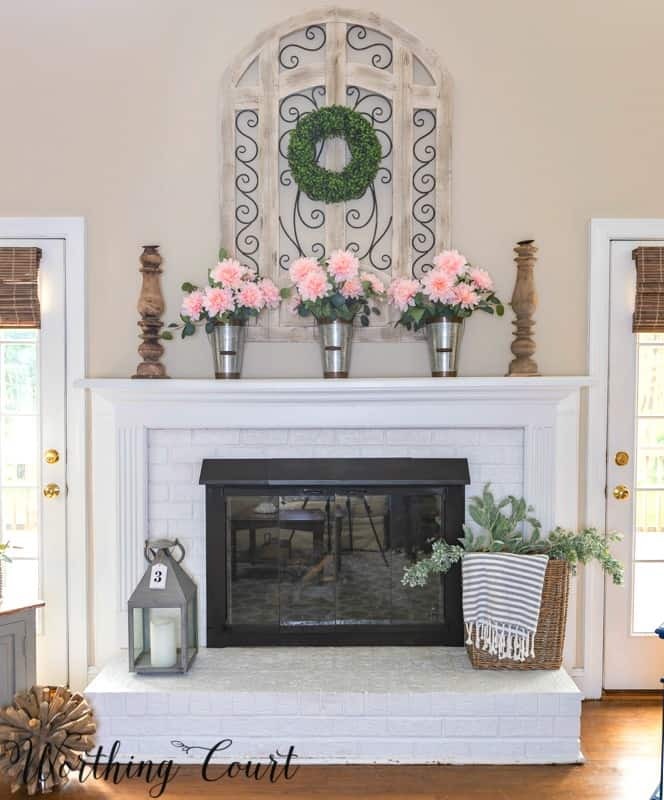 I love this mantel, beautiful! I am so inspired, after work today I am going to measure to see if the Wood and iron piece from Kirklands will fit good above my mantel!!!! The dark stained one is on sale but I like the white, I might attempt to paint it just to save money even though I have no painting skills lol!